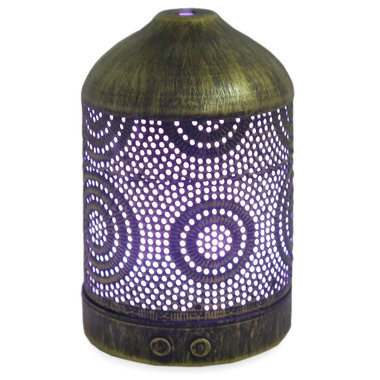 Scentuals' beautiful rustic metal-finish Euphoria Ultrasonic Diffuser is a wonderful addition to any space. Easy to use and powerful, this diffuser is a fantastic option for anyone new to the uses and benefits of essential oils, and for seasoned aromatherapy enthusiasts. The natural wood finishing and warm LED lights add an inviting touch to any environment while scenting the air delicately with pure essential oils. Brighten your home with scents that move you. Love how you can let the colours naturally cycle and by hitting the light button again you can freeze it at a blend. Stop it at the right moment and the yellow to red change stays at a gorgeous warm candle like glow. Runs a little noisy, had to move it away from our main living space as the â€œdripping waterâ€� noise was distracting and concerning to visitors. Runs a solid 3 hours on continuous and with 4 drops of oil it fills a standard mainfloor with fragrance. Power cord is very slim and tucks under baseboards and behind tightly placed furniture easily. Wish I could add a pic, not just a youtube link, to this review... WELL? Would love to show it off in a real home.